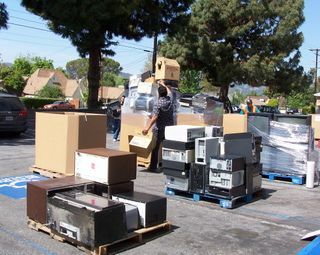 Christ the Shepherd Lutheran Church was doing land office business in their first e-waste drive -- this was collected in the first hour! 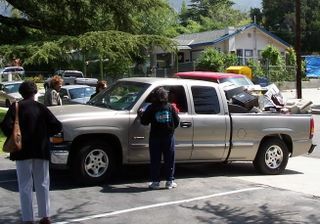 ... and there was more coming in! 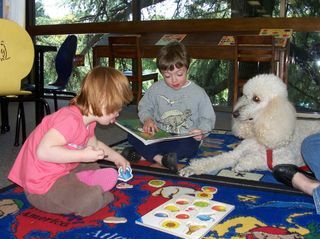 Rosie and Jacob (aka Spawn 3 and 2) read to Pearl the poodle as part of "Barks and Books" at the library. 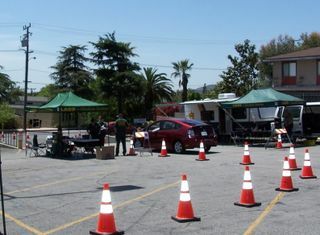 As of 1 PM, sheriff's deputies had collected 57 firearms as part of the "Gifts for Guns" program at the Rite-Aid parking lot. Yes, the red Prius with the Obama sticker was turning in Gun #58. 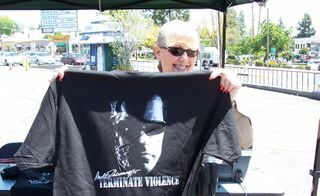 Sheriff Lt. Sheila Sanchez shows off the T-shirts that were given out during the exchange, gifts from Gov. Schwarzenegger. However, Ryan (which is the only name he would give) was at the gun exchange to make a counter-offer. 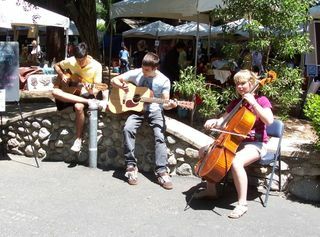 These young musicians are preforming as part of the Pasadena Waldorf School's Festival of Art, also going on on a busy day in Altadena.